Tonight I have my card for the DT at Aud Sentiments. The image is from Stamp Fairy and I used a sketch from Chocolate, Coffee and Cards but that challenge has already closed. DP is from the KaiserCraft Devonshire Collection and the green cs is DCWV. Ribbon is from Michaels and rhinestone strip is from HL. The sentiment is from MFT. Sure glad I live in a forest and don't have to rake leaves anymore! Be sure to check out what the rest of the DT created at Aud Sentiments! i love the layers and the colour-scheme! the image is very sweet! 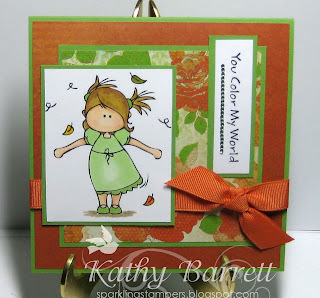 I really like the color combo of the green and rust in that DP Kathy! And I love the bow/knot treatment on your ribbon - that is a nice touch! This is a lovely card from the colors, to design to image. IT reminds me of Hangler Stangler...in fact I did a double take!